I am 50 years old. What I see in my clients offices are millennials rapidly moving into the age of business leadership and authority. 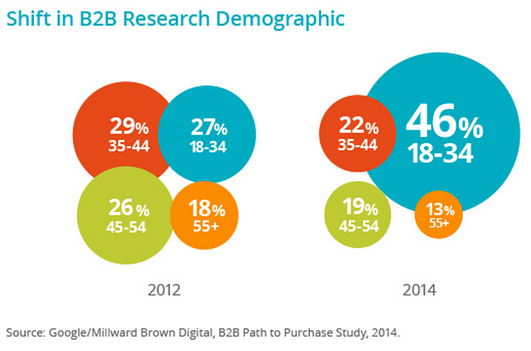 According to a recent Google and Millward Brown study 46% of potential buyers researching b-to-b products are millennials today. Guess what. They do not buy the way we did back when we were younger! Over the recent years that they have conducted this study, the change has been rapid. Mike Miller, Google's director of business and industrial markets said "We saw a big shift in a two-year time span in the number of millennials that are in the b-to-b purchase path." Business leaders must fear age. By that I mean that leaders, through unwillingness or ignorance, become out of touch through time and do not have a bearing on how those younger than them are buying. So what? The danger is that today's business leaders who are not working to understand how millennials work, they are making marketing and sales decisions that become barriers to the customer decision journey. "Nearly half of b-to-b researchers who use their mobile devices for product research do so while at work." So I ask the 40, 50 and even 60 year olds that are making business decision around marketing and sales one simple question. Are you making choices that reflect this data? P.S. Our marketing automation primer is a good way to shift gears and understand today's models for selling to a millennial buyer.